Pyramid 13, or simply Pyramid solitaire, is one of those games that is deceptively addictive, despite the fact that the game does not actually work out a very large percentage of times. A mixture of luck and some strategy is usually required to win the game. The version of Pyramid 13 included in Solitaire Whizz is also available as a free standalone app: check out Pyramid 13 Solitaire Free for iPad. 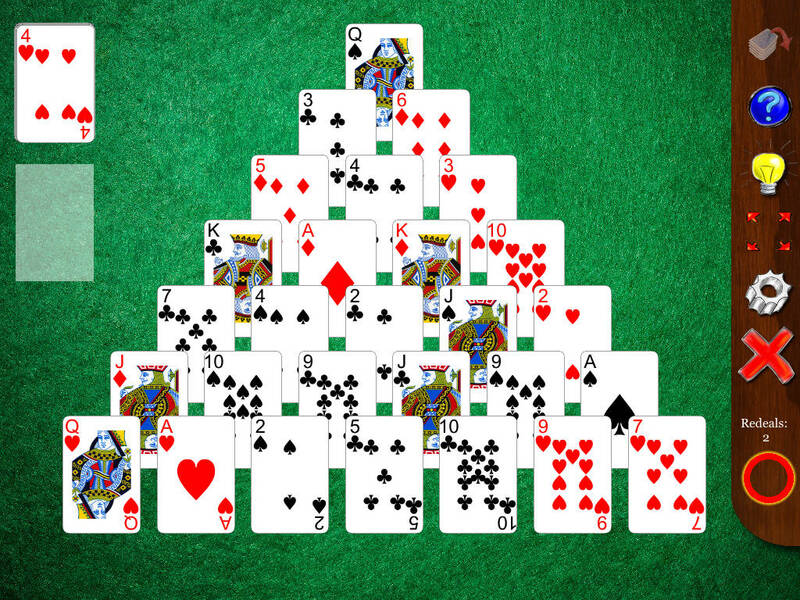 The initial layout consists of a "pyramid" of face-up cards as shown in the screenshot, with 1 card at the top, 2 cards in the second row, 3 in the third etc down to a bottom row of 7 cards. Except for the bottom row, each card is therefore partially covered by two cards in the row below it, although all cards are visible. The remaining cards form the stock. The aim of the game is to discard all cards from both the pyramid and the stock, by "pairing them off" as described below. Any card in the pyramid that is not covered by any other card is available for play. The top card of the stock pile is also available for play. Double-tapping the top pile of the stock moves it on to the waste pile, and the top card of the waste pile is also available for play. You can discard any pair whose ranks total 13: pair any 6 with a 7, an 8 with a 5, a 9 with a 4, a 10 with a 3, a J with a 2 and a Q with an A. Kings can be discard on their own. Any two available cards can be paired off together. Therefore, you can pair off two available cards from the pyramid, a card from the pyramid with the top card of either the stock or the waste pile, or the top cards from the stock and waste. Despite the simplicity of its gameplay, Pyramid 13 will not come out as frequently as games such as Klondike and indeed other pair discarding games such as Monte Carlo. To win the game, you will often need to employ at least some basic strategy. try to avoid discarding cards from the pyramid so that you end up with only a single card number available– instead, try to maximise your available moves by having cards with a variety of ranks available.